Sometimes when the insides of the dyed leather shoes become dampened by sweat, excess pigment can leech out of the leather and cause staining on your feet or socks. Often occurring in new shoes, this problem typically subsides with time; however, a more immediate solution is to waterproof the leather so that the moisture from sweat will not be able to reconstitute the dye. Leather waterproofers come in the form of sprays, creams and pastes. Sprays are the most convenient and easy to use, but creams and pastes often contain wax and oil for simultaneously conditioning your leather. Wipe down the insides of the shoes with a slightly dampened cloth to remove dirt and residual sweat. Dry the shoes before applying the waterproofer. Spray an even coat of waterproofer on the insides of the shoes. Make sure all areas are covered. Allow the waterproofer to dry. Re-apply waterproofer to the shoes regularly to maintain protection from moisture. Wipe down the insides of the shoes with a slightly dampened cloth to remove dirt and residual sweat. Dry the shoes before applying waterproofer. Fold up a clean, soft cotton cloth and dab one end into the paste or cream. Rub a liberal coat of the waterproofer onto the insides of the shoes. Re-dab the cloth in the paste or cream as needed. Re-fold the cloth to expose a clean side. Work the waterproofer into the leather by rubbing in circular motions while applying firm pressure. Use a clean, soft cotton cloth to remove any standing waterproofer then wait 12 hours before wearing the shoes again. Re-apply waterproofer to the shoes periodically to maintain protection from moisture. Give your shoes extra protection by waterproofing the outsides as well. In addition to waterproofer, treat your shoes routinely with leather conditioner and with leather polish to ensure their longevity and appearance. 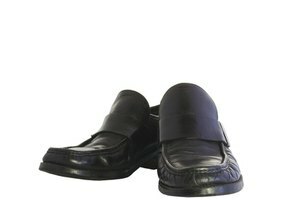 Acquire a leather waterproofer that is appropriate to the type of leather that your shoes are made up of. For example if you have suede shoes, ensure that the product is designed for use on soft leathers.